How Does Turmeric Help with Inflammation? Information and statements made are for education purposes and are not intended to treat, prevent or cure disease and should not replace the advice of your doctor. Turmeric is a golden yellow, Indian spice packed with the potent phytonutrient, curcumin. It’s been used as an Ayurvedic medicine for thousands of years and is now gaining a reputation as a natural remedy in the Western world with hundreds of studies linking it with anti-inflammatory health support. 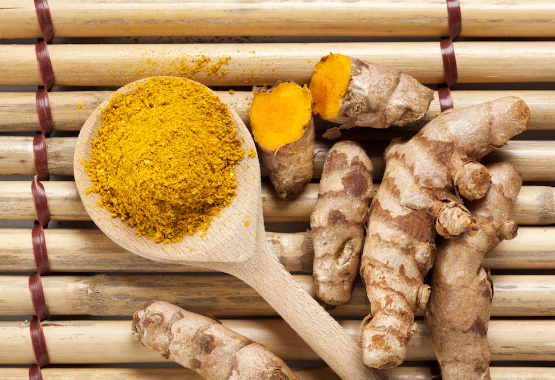 So, what’s the science behind turmeric and chronic inflammation? First, we need to look at what inflammation is. Inflammation is the body’s natural response to infection or trauma. For example, if we get a splinter in our finger, it causes a puncture wound which becomes red, hot and swollen. This is a result of our immune system triggering our white blood cells to release chemicals called cytokines. These cytokines promote an increase in blood flow to the area and stimulate essential healing mechanisms. This is what causes the redness, heat and swelling. Inflammation occurs hand in hand with mild infections. An infection is the action of a bacteria or virus causing the reaction of the immune system and the inflammatory response. Inflammation is essentially a good response. It helps our body fight off the effects of harmful trauma, bacteria, viruses, irritants and allergens. Without inflammation, our body would succumb to minor injuries and infections that we’d otherwise be able to fight. This kind of mild inflammation is known as acute inflammation, its onset is sudden with prominent visible symptoms but its effects are self-limiting and often disappear within a few days. However, if acute inflammation is prolonged, it becomes chronic. Chronic inflammation occurs more slowly, over weeks and months, causing severe and progressive injury to internal tissue that may not be immediately apparent. Chronic inflammation occurs in autoimmune conditions, when the immune system attacks the tissues of the body. What conditions are related to chronic inflammation? Examples of chronic inflammation related conditions are rheumatoid arthritis, lupus, ulcerative colitis and Crohn’s disease. In fact, more than 200 inflammatory diseases exist, the name often ending in -itis, for example arthritis – inflammation of the joints, meningitis – inflammation of the brain, and bronchitis – inflammation of the bronchi in the lungs. Left untreated, chronic inflammation can cause major damage to the cells and tissues of the body, i.e. in the joints, gastrointestinal system or lungs. What about other negative health effects of chronic inflammation? Studies have linked the increased blood levels of cytokines related to chronic inflammation to many other health conditions including cardiovascular and lung diseases, diabetes, poor bone health, depression, Alzheimer’s disease and certain cancers. It seems a cruel twist of fate that one of our crucial repair mechanisms can become a causative agent for disease. It’s therefore clear that for many reasons, we should seek to keep inflammation only to essential levels. How can turmeric help inflammation? Cytokines, the chemicals released during an immune response, are known to play an extensive role in inflammation. There are many types of cytokines, but one type called TNFs (tumour necrosis factors) play the biggest role. One particular type of TNF, TNF alpha, is the really nasty guy. In chronic inflammation, TNF alpha is responsible for the damage of tissue associated with painful inflammatory conditions such as arthritis and Crohn’s disease. Therefore, in cases of chronic inflammation, drugs are often used that block the release of TNF alpha. These drugs are administered by injection, are expensive and often cause side effects. But what if there was an alternative? Something that could assist blocking TNF alpha, is cheap, free from side effects and able to be taken orally instead of via an injection? All hail curcumin! Studies have indicated that curcumin can safely block TNF alpha in humans. It’s cheap, ‘orally bioavailable’ and has no known side effects. Curcumin has been shown to assist in the suppression of inflammation in clinical trials with patients with conditions such as rheumatoid arthritis, inflammatory bowel disease, psoriasis and poorly controlled asthma. Studies are continuing and are continually showing great potential for curcumin as a therapeutic agent. The doses at which curcumin is needed to have this therapeutic effect are higher than adding turmeric to food alone, although consuming turmeric as a spice or in a drink can never be underestimated. Concentrated turmeric and curcumin extract capsules have been shown to be more bioavailable, meaning our body can absorb them better and therefore use them to greater effect. Many studies have conclusively linked curcumin to specific chronic inflammation-related conditions. One study provided a “compelling justification for its use as a dietary addition to conventional therapy for the treatment of arthritis”. Another found that sufferers of inflammatory bowel conditions such as Crohn’s disease and ulcerative colitis “may benefit from increased turmeric consumption”. A further study concluded that “the low cost, pharmacological safety, proven therapeutic efficacy and multiple targeting potential make curcumin a promising agent for prevention and treatment of various human diseases”. Many of these studies provide enough evidence to provoke further, much larger clinical trials that could result in curcumin as an accepted standard treatment for many inflammatory conditions. And whilst we’re already celebrating the anti-inflammatory power of turmeric and curcumin, we can’t wait for the day they become mainstream and beneficial to sufferers of painful chronic inflammatory conditions everywhere.